[caption id="attachment_8663" align="aligncenter" width="714"] LOUIS MASAI - RHINO[/caption] According to the International Union of Conservation of Nature (IUCN) there are currently 23,250 species listed as threatened. This means: critically endangered, endangered or vulnerable. Adding extinct and extinct in the wild species the figure is 24,153. It’s widely predicted that as many as two-thirds of all species could be near extinction by the end of this century. But, some are now rising in population due to increasing concern about the extinction crisis. Co-ordinated conservation efforts include the protection of natural habitats and prevention of destructive practices such as illegal hunting. 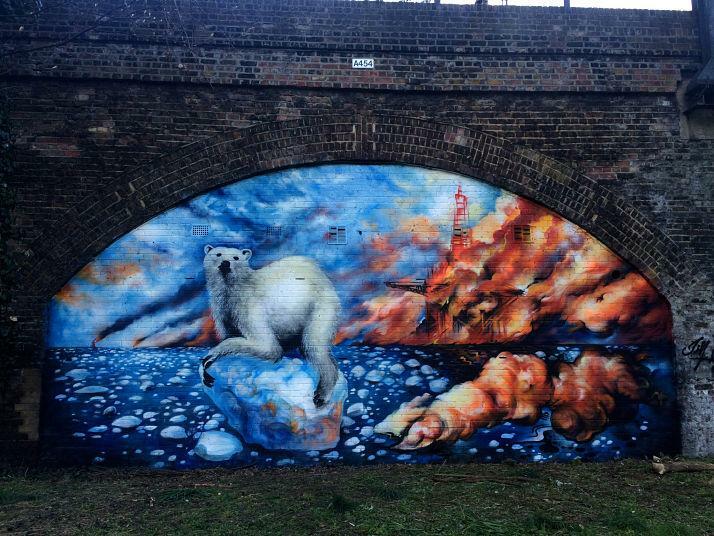 ENGANGERED 13 is a curated mural project to raise awareness of endangered species (Sunday 10th April 2016, Ackroyd Drive, London). 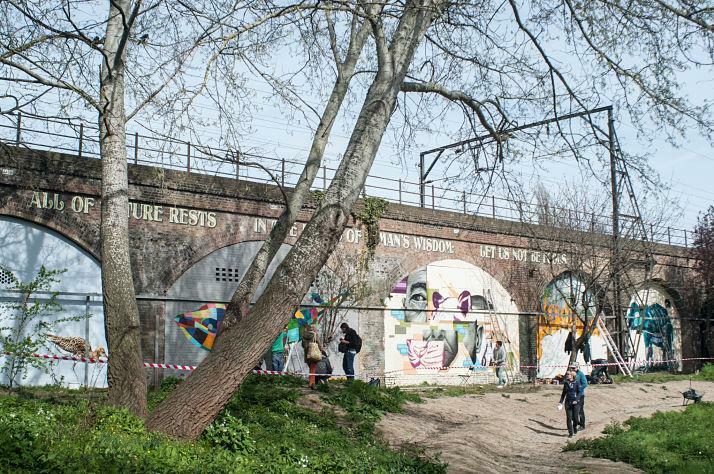 Produced by artist Louis Masai and Human Nature, the environmental art platform, 13 artists will take on a 120 metre stretch of railway arches in Tower Hamlets, London; painting murals and creating a miniature sculpture trail. The murals will be of threatened species from across the globe including a Curlew; Orangutan; Rhino; Blue Whale; Bateleur; Polar Bear; Grey-Breasted Parakeet; Boeseman’s Rainbow Fish; Hummingbirds; Elephant; Tiger; Bees and Coral Reef. After the event a website will be launched by Human Nature to provide more information on the threat to each species and how people can act to help local conservation efforts. According to the International Union of Conservation of Nature (IUCN) there are currently 23,250 species listed as threatened (critically endangered, endangered or vulnerable). Adding extinct and extinct in the wild species the figure is 24,153. It’s widely predicted that as many as two-thirds of all species could be near extinction by the end of this century. But, some are now rising in population due to increasing concern about the extinction crisis. Co-ordinated conservation efforts include the protection of natural habitats and prevention of destructive practices such as illegal hunting. Charlotte Website of Human Nature, the environmental art platform, said: “ENDANGERED 13 brings together some of the UK’s most talented artists, reflecting a growing concern about our relationship with nature. Our mission is to help to create a more sustainable future together with artists. We believe their voice is crucial in exploring some of the world’s biggest issues, so it’s great to get this project off the ground.” Louis Masai, artist added: “With ENDANGERED 13 we’re uniting many creative minds, building a community around an ever increasing global concern: the environment. Each artist will bring their own approach but we are united in calling for change. We want to see these species rise in number and their natural habitats saved within the next ten years. It’s one of the most critical issues for our generation.” The project is being made possible with the support of The Friends of Tower Hamlets Cemetery Park, Montana Cans, Earthborn, Kabloom and Handover. ENDANGERED 13 will be completed on Sunday 10th April (midday-7pm) and available to view ongoing. The project is being made possible with the support of Montana Cans, The Friends of Tower Hamlets Cemetery Park, Kabloom, Handover and Earthborn. The permanent home of ENDANGERED13 will be on Ackroyd Drive at Tower Hamlets Cemetery Park, over 30 acres of woodland in the heart of East London. Opened in 1841, The City of London and Tower Hamlets Cemetery is now a designated park, Local Nature Reserve and Site of Metropolitan Importance for Nature Conservation. It is run by our project partners, The Friends of Tower Hamlets Cemetery Park. Louis is a British painter, sculptor, illustrator and street artist perhaps best known for his murals of endangered animals, in particular, bees. A graduate of Falmouth School of Art, he strives to find a human reference to animals juxtaposing an element that might not be previously obvious. His show ‘last of my kind’, documented critically endangered birds with references to extinct musicians, questioning why humans often fail to recognise a disappearing species yet mourn the death of a celebrity. An artist at heart, Louis is increasingly seen as an activist, a term he uses with some reluctance whilst acknowledging the power of visual language and social media. www.louismasai.com Andy Council Andy Council is a Bristol based artist who creates composite beasts made up of architectural landmarks and other recognizable elements. The city of Bristol is often present in his work as are Dinosaurs, which have become one of his main motifs. His work takes the form of illustration, painting, sculpture and huge spray painted murals, which can be seen across the city. His most recent mural 'The West Street Horse' has become a landmark in the South Bristol area. His work has been featured in publications such as The Guardian, Marie Claire and Time Out and he has work in Bristol City Museum's permanent collection. ATM ATM grew up in a mill town in northern England and went to art college in Sheffield. Now a London-based artist, his paintings for the most part document rare and endangered British birds. His love of nature is evident in the staggering levels of flair and detail with which he paints these birds. In 2014 he started painting art on the streets of east London, completing a three-meter tall image of a great bustard on a black-painted brick wall, off the Whitechapel Road. His paintings have since begun to thrive across the capital. Carrie Riechardt Carrie Reichardt is a craftivist whose work blurs the boundaries between craft and activism, using the techniques of ceramic and mosaic to create intricate, politicized works of art. Reichardt achieved a First Class degree in Fine Art from Leeds University and has since been involved in international community and public art projects for two decades. Her most recent ceramic installation was for the facade of the Victoria and Albert Museum, whilst her Tiki Love Truck, a ceramic-adorned vehicle, was the star exhibit inside as part of the critically acclaimed Disobedient Objects exhibition. Dr Zadok Dr Zadok, founding member of the well-respected Dead Leg Crew, is a London based Artist, Muralist & Illustrator. Zadok blends superbly observed and interpreted animals, with expressive character and architectural elements. He also works closely with Jim Vision at End of the Line. Faunagraphic Faunagraphic, a Sheffield based illustrator and artist, specialises in spray painted murals. Faunas graffiti journey began in 2006, which since then has blossomed into a passion that encompasses traveling around the world. Her creative focus centers around environmental awareness drawing Inspiration from nature, Wildlife, and the cosmos. Birds are a reoccurring favorite but the smaller creatures, which make a bigger difference to the planets makeup, often make an appearance too. Fiya One Fiyas is a prolific artist from South Africa with roots based firmly in the traditional graffiti scene. Jim Vision One of London’s internationally acclaimed graffiti artists, Jim Vision believes in creating powerful innovating art that engages the general public. He paints technically exceptional mural art and also curates ground breaking events that showcase the best contemporary graffiti artists of his generation. End of the Line, his creative studio, was set up in 2009 and houses the talents of London's finest Aerosol muralists. Together they strive to bring a unique urban vision to professional projects. Jonesy Secretive street artist Jonesy (Mark Jones) is best known for his miniature works in bronze. Based in East London, his sculptures are often placed high up on the top of street signs or on walls. But these are just one outcome of his many talents. He sculpts, paints, prints and makes musical instruments, the latter made from sustainable fruit trees and recycled wood. Jonesy’s main interests are environmental issues, science and nature, and the survival of man as a species. Since leaving art college in 1986, the main focus of his work has been related to Man’s relationship with the natural world. Louis Masai Louis is a London based painter, sculptor, and mural artist, perhaps best known for his documented work about endangered animals, in particular, bees. 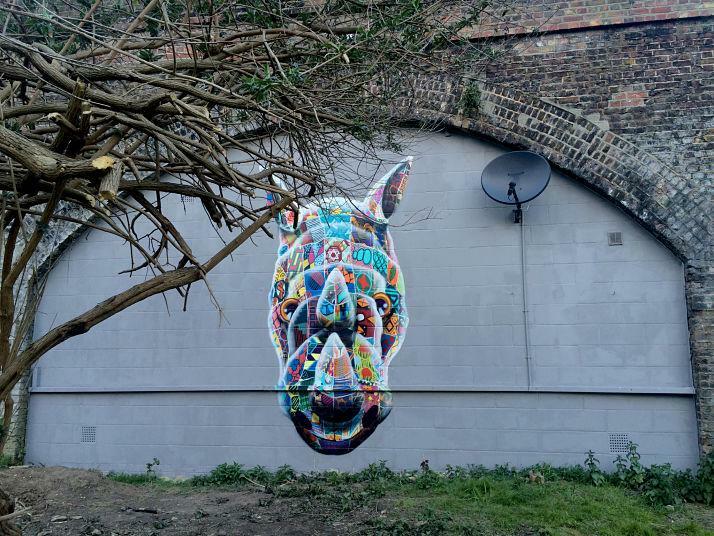 Louis Masai wants to encourage the general public via the use of his art to embrace change and ecological awareness. He is an artist first and foremost but his strong beliefs inform his practice at every turn. It is easier to fail both as an activist and an artist than it is to succeed. Masai is smart enough to know that and brave enough to carry on regardless. Masai understands that the ecological issue facing mankind is possibly the greatest threat we have ever faced and one, which this generation has a duty to address. He works closely with environmental agency synchronicity earth and is part of Human Nature. Rocket 01 Rocket01, based in Sheffield UK, specializes in graffiti, murals and fine art. Rocket has a wonderful palette that reminds the viewer of an organic natural environment, if graffiti were nature, rocket would have been there at the start. His paintings often capture an interesting element of apocalyptic underwater worlds, or jungle fevered explorations. Vibes Vibes is an internationally renowned mural artist based in London. Having been at the forefront of the UK Street Art scene for over a decade and painted large scale murals across Europe, he has held four solo exhibitions and taken part in numerous group shows, from the Saatchi Galleries head office in London to the Schoeni Gallery in Hong Kong. Von Leadfoot Born and raised in Los Angeles, California, Leadfoot spent the majority of his life immersed in L.A.’s renowned hot rod and vintage motorcycle culture. After spending a few years abroad in London, England, honing the nearly forgotten craft of sign writing, he took his skills on the road as he painted his way around America. In his home-built and hand painted ’57 Ford F100 he racked up over 12,000 miles whilst painting his way from coast to coast, through 33 States. He’s since been christened the Patron Saint of Paint, an American sign painter & pinstriper extraordinaire, capable of transforming soulless objects into divine pieces of functional, commercial art. Currently located back in London, he specializes in traditional free-hand pinstriping, sign painting, gilding, & design. Xenz Xenz, also known as Graeme Brusby, has deep creative roots in graffiti, which he first took up in his hometown of Hull in 1987. Over two decades later this has became the foundation for his extraordinary painting and draughtsmanship skills. Today he is based in London where he makes his living as a studio-based artist and muralist. In 2013 he published a book entitled “The Art of Xenz”,documenting his career as both a painter of walls and canvases. He is represented by Lazarides Gallery.